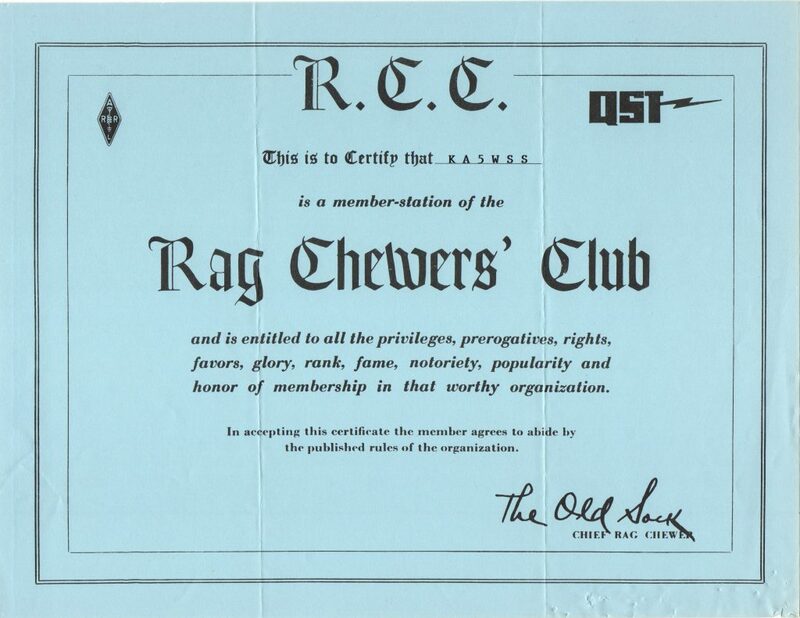 I think the Rag Chewers Club (RCC) was the first Amateur Radio award I qualified for. To qualify, one need only provide evidence of having made a single QSO that lasted more than 30 minutes. The implication being that such a contact involves interacting with another Ham to cover more than the abbreviated signal report and location contact. To be honest though, I’m not sure what I did should have qualified. At the time I was making contacts as a CW operator at speeds near 5 WPM. A 30 minute QSO probably covered little more than RST, location, rig and antennas being used, if that. Still, it was the first of several, and in the future hopefully many, awards and Amateur Radio certificates. For years the award had been offered by the American Radio Relay League (ARRL). In 2004 it was discontinued by the League and taken up by a group calling itself the The Society for the Preservation of Amateur Radio (SPAR). It’s unclear whether or not the award is still actively awarded.